Back in Santiago, it’s first things first. 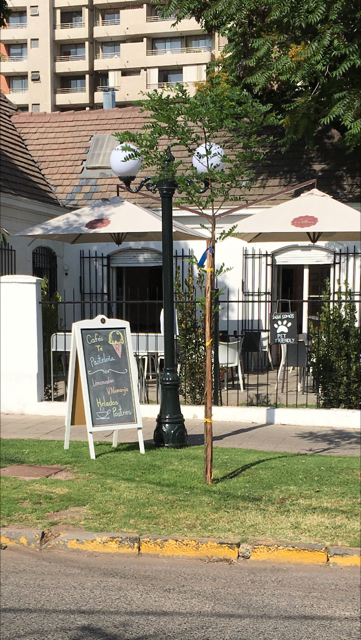 Until I have walked the pedestrian path that winds up Avenida Pocuro, one of the traditional Providencia Municipality’s major thoroughfares, I don’t feel like I have arrived in Chile. This is why I usually do the walk immediately upon arrival. I need to get in touch with “the street”, so to speak. 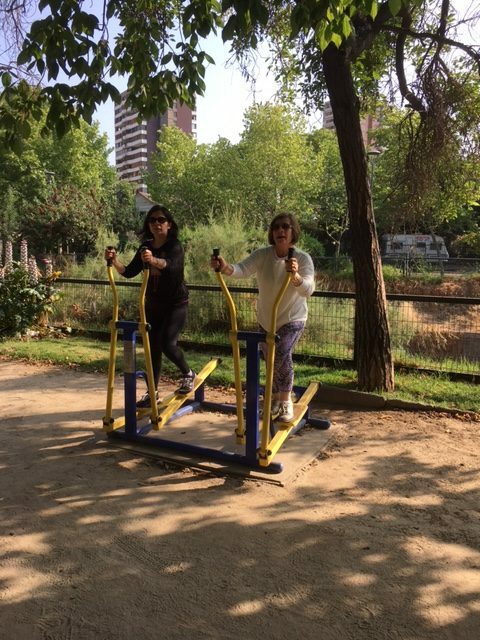 So after a midnight arrival in Santiago, and a few short hours of sleep, we take off on an early morning jaunt up Pocuro, over Tobalaba, down Eliodoro Yañez, to Avenida Holanda where we turn south to return to our apartment, a pleasant two and a half mile walk. Immediately upon setting off on this walk, I am reminded that this year we traveled to Chile several weeks earlier than we usually do; the air is early-spring fresh, not dusty-hot as in January and February. 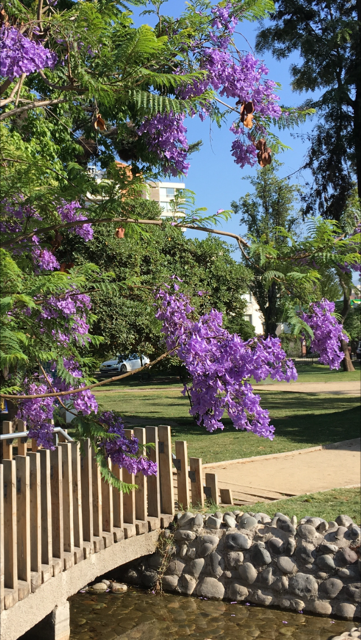 The Jacaranda trees are still in their violet splendor and freshly planted pansies adorn every corner. Damn it. I thought I would at least make it through this first walk without that issue rearing its ugly head. 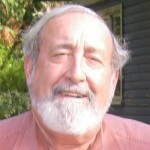 Still smarting from the outcome of the election, I explain that in spite of my vote to the contrary, Trump won the election, and we will just have to live with him, give him a chance, as at least one reader of this blog has urged. “But you came here, didn’t you? Are you going to stay this time?” he says with a deep and knowing laugh. Then he remarks that he read (after all, he carries newspapers under his arm for hours every day, some of it must rub off) that Trump is naming lots of generals to his team. I ask him what he thinks of that. He laughs and states that in Chile they have quite a bit of experience with that. “I remember very well. Generals give orders”, he said, “and you have no option but to obey”. I argue, admittedly without much conviction, that the Generals in the US are maybe different than the Chilean Generals he is remembering from the Pinochet era. But he shows that he knows a thing or two about this subject, with his retort that “maybe they are different, but ours were trained by yours, weren’t they?” He is right of course. Mario has to run off to hand a paper to a passing motorist, so we too go on our way, promising to buy the paper from him every morning until April when I would return to the US. 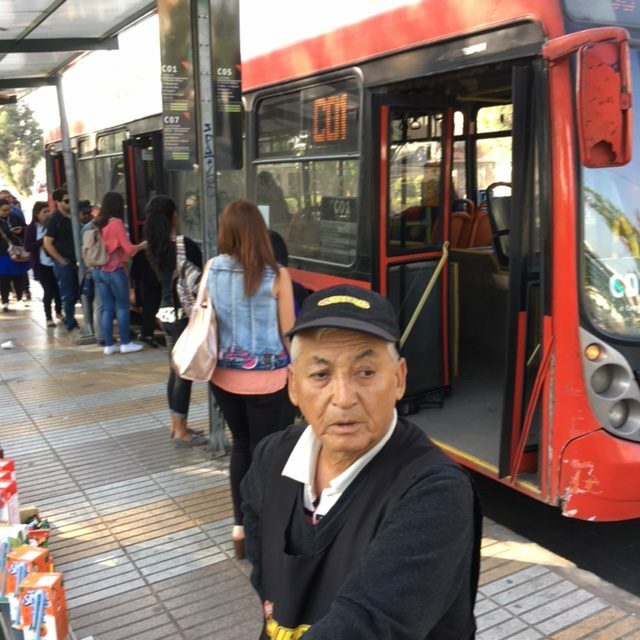 Next stop is at the corner of Pucuro and Tobalaba, where another street vendor, Claudio, sells newspapers as well as cookies, candy, and soft drinks to passengers getting on and off the much maligned Transantiago city transport system buses. 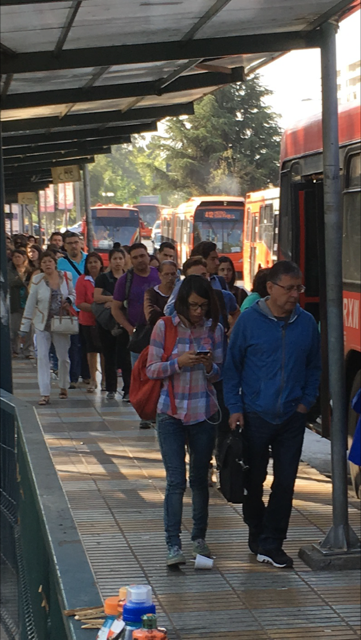 As I observe the long lines of waiting passengers, which has been one of the unfortunate characteristics of this system since it was installed over ten years ago, I ask Claudio how the transit system is working. “Worse than ever” he replies, “even the official inspectors don’t come and do their job at the bus stops. They monitor the details of the service from a hiding spot back in the bushes for fear of being accosted by angry passengers frustrated by the long waits and irregular service.” True? I don’t know. I look around but do not see any inspectors hiding in the bushes; but I don’t see any standing where they are supposed to be either. Even though the lines of waiting passengers are a bit long today, plenty of buses are lined up along the stop and the waiting passengers, mostly young students off to classes, don’t seem too out of sorts. Several years ago I made a habit of stopping to talk with Claudio, mainly because at the beginning he was accompanied by a young man, his son, who helped him sell his goods. The kid seemed to be a really well mannered and alert boy, and he seemed to enjoy answering my questions about his school, soccer, and other things young Chileans are willing to talk about with Gringos. One year when we left Chile to return to the US, I carried a nice parka that we no longer needed with me on my walk, to give to this kid, Jaimito, for the upcoming cold, rainy winter. That day, unfortunately, he was not there, so I gave the parka to his father to take to him. That was several years ago, and in the interim I have not seen Jaime but I always talk to his father about him. Today his father proudly reports to me that Jaime, now 17 years old, has graduated from school where he became a trained auto mechanic, has a good job, is a head taller than his father, and is doing very well. I’m happy for Jaime, I just hope what his father tells me is true. I think it is; his father is beaming. 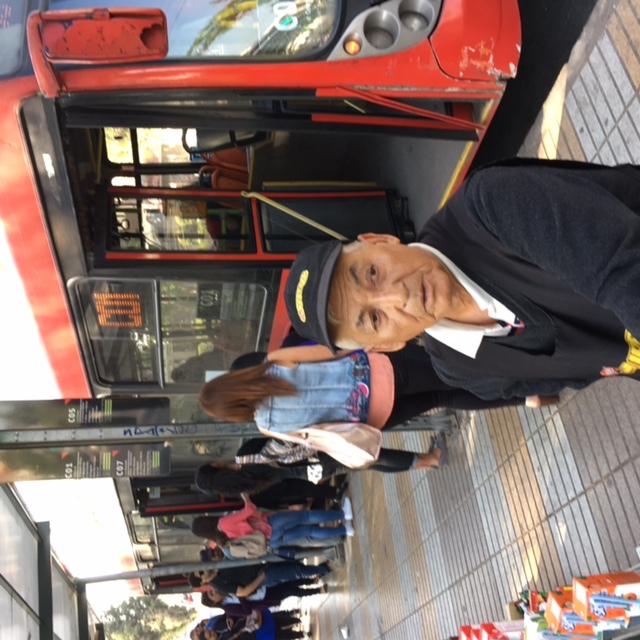 Next stop is along Tobalaba Avenue, that runs next to the San Carlos Canal carrying cold muddy runoff water from the Andes just to the east of Santiago down through the city into the Mapocho River and eventually out to the Pacific Ocean. 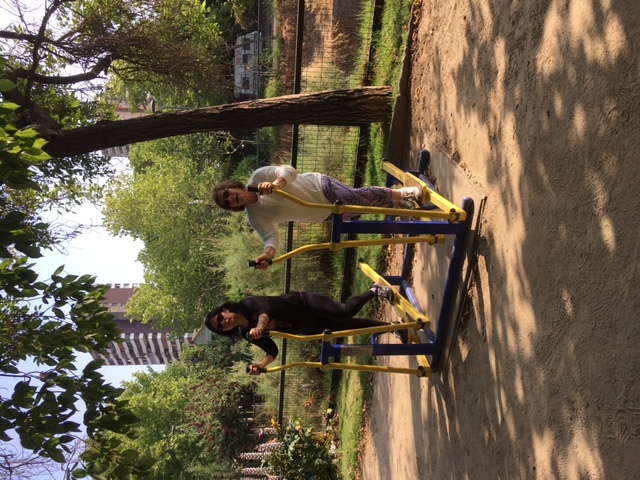 Halfway along the walking path there is a very nice exercise area with simple but well built machines. We find them nicely painted and all in good working order, all set for the summer months. Ximena tries them out before we move on. We next head down Eliodoro Yañez Avenue, past the subway (Metro) station on the corner. All new shops are springing up in this area due to the metro station and the apartment building boom in the neighborhood; there is a Dunkin Donuts, a 7-11 type mini market, and a sharp looking cafe named COFI that offers “Breakfast, afternoon tea (onces), and WIFI”. 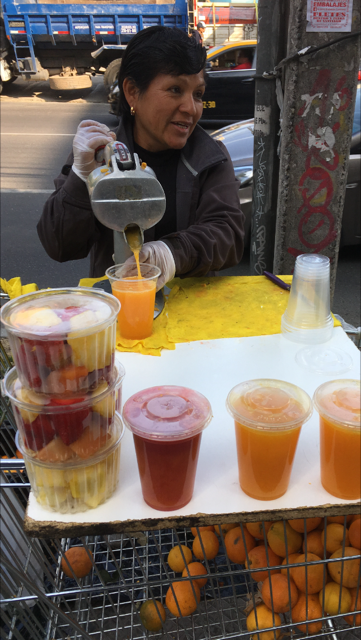 We stop to chat with Luz, an enterprising young Peruvian woman who now sets up with her simple juicer along the street and sells freshly squeezed orange juice; “only Valencia oranges”, she assures me. We buy a huge cup for 1,000 pesos (about US$ 1.50); delicious. 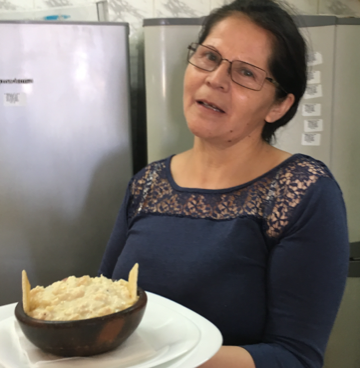 The recent proliferation of vendors of street food in Santiago coincides with the influx of Peruvians (and Bolivians, Colombians, Dominicans, Haitians). Some of the old shops are holding on in the face of the face lift the whole neighborhood is receiving. The old bakery, which early in the morning puts out warm fresh-out-of-the-oven bread, still fills the street with that hunger producing smell of freshly baked hallullas and maraquetas. I fear it can’t hold on forever. We buy two double maraquetas for about US$ 1.25. That’s not as inexpensive as it used to be, back when bread was subsidized as a way to help the poor put food on the table, but this morning it sure hits the spot. At the corner of Eliodoro Yañez and Hernando de Aguirre avenues, now returning towards our street and apartment, we are pleasantly surprised to find a newly-opened bistro named Villa Europa, offering a lovely patio and interior dining area serving all types of breakfast, lunch and dinner and, like the COFI place we just passed, WIFI! WIFI is a must if you want to sell food and drink in Santiago, since so many iphone owners here do not purchase data plans for their phones. We chatted with the young Chilean owner of the Villa Europa while he showed us the remodeled old classic Providencia home now turned into a restaurant. It is a work in progress, he explained, and soon will have a pizza oven and takeout window (pizza a la piedra he assured us). It’s next to the recently opened ice cream outlet where he sells creamy gelato type artisan ice cream of flavors like lucuma, chirimoya, and cookies and cream (a must for the kids, he says). Close enough to our place to walk, this will surely be a frequent stop for us over the next few months. Back home, I kick off my walking shoes and open the newspaper, a daily ritual I really enjoy. And sure enough, I am immediately inserted again into the polemics of Trump. 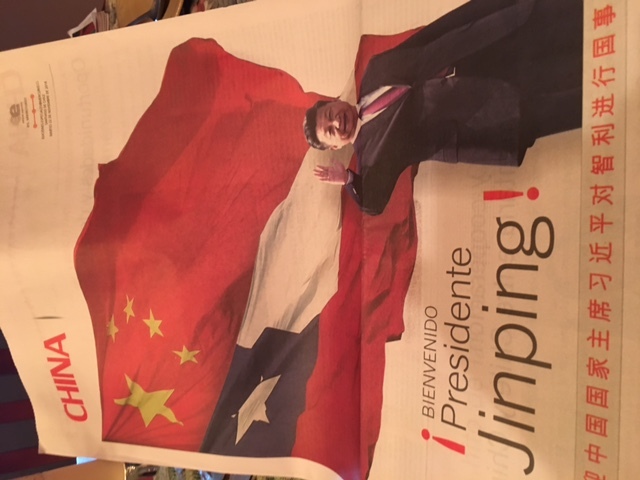 On one page in the first section, an imposing picture of Xi Jinping fills the page, part of an article signed by him on the occasion of his present visit to Chile. He is in Chile following the meeting in Lima, Peru, of the APEC countries, where freer global trade within countries of the Asia Pacific region (including Chile and, of course, the US) was high on the agenda. 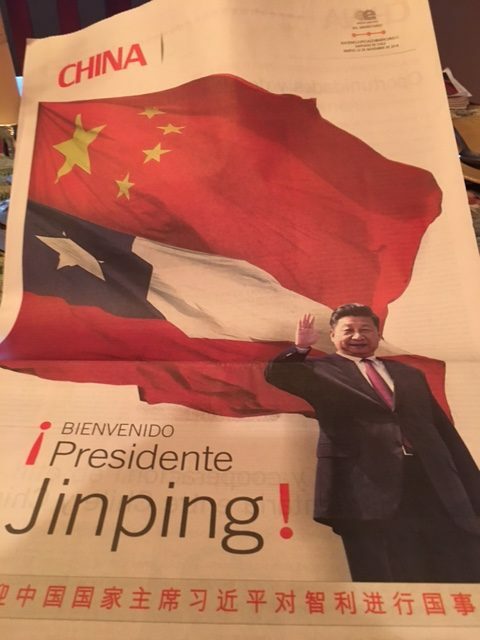 His full-page article is entitled (in Spanish and typically flowery Chinese style) “Building Together a more Splendid Future for Relations between China and Chile”! The paper carries a flamboyant insert with descriptions of all the opportunities open to Chile in the huge Chinese market, cultural exchange programs, and collaborative multilateral endeavors the two countries will be engaged in. On the opposite page from the picture of the smiling Xi Jinping and his optimistic article is a picture of a dour Donald Trump under the headline: “Trump announces that from the first day in office he will begin the process to pull the US out of the Trans Pacific Partnership (TPP) agreement.” And of course the paper is filled with articles and opinion pieces on the significance of the US pulling out of the TPP. A quick reading (I am admittedly a somewhat biased reader) suggests a certain level of comfort, indifference maybe, even some optimism here in Chile towards the opportunities that might be associated with a shift away from a regional trade agreement led by the US to one that includes China. Maybe it’s wishful thinking; maybe they are right. Trade, Trump and international affairs is too big a topic to attempt to sort out in this blog posting I wanted to focus on my Pocuro walk! However, the optics from here, today, after one day on the walk and then taking a glance at the opinions and feelings being expressed against the backdrop of a jubilant Xi Jinping as he signs multiple cooperation agreements with the Chileans, leave me concerned that if the first steps of the President-elect are any indication, the US is headed in the direction of a closed, circle-the-wagons defensive stance in the world so very antithetical to what US global leadership has been based upon, and requires. This turning inward will create avoid, and as the Jinping visit to Chile shows, if you are paying attention, this void will be quickly filled. Comments welcome, friends; contrary as well as supportive. 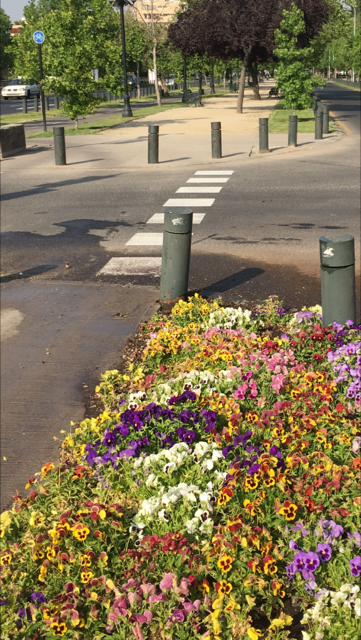 Posted in Santiago, Chile, on November 23, 2016. This delightful walk supposedly for exercise, but really for connection and food, makes me very nostalgic for our time in Santiago, our friends and the great times we shared on you back terraza with a bottle of wine. Ned, I don’t recall any times on the terraza with A bottle of wine; SEVERAL, I think, is more like it. You are missed, in Santiago, and on the terraza. Enjoyed our “walk” with you down the avenue. It was a nice summary on your personal stroll, getting an update on Chilean perceptions of current issues, and other topics. It sounds like you enjoyed seeing old friends and even found a new place to try out. Looking forward to seeing you folks and others in a couple of months. Thanks for all the work you folks have done organizing our upcoming reunion (and especially for locating it close to my PC site location in La Ensenada, working in Vicente Perez Rosales Nt. Park, just on the opposite shore of Lake Llanquihue). I found out only recently, from Dr. Emily Wakild, (a researcher/author at the University of Idaho) that Vicente Perez Rosales was actually the 2nd National Park on the South American continent. Argentina, in fact, officially established by Decree (Feb. 1, 1904), the land adjacent to VPR which had been donated by “Perito” Moreno, as the “National Park of the South” (now Nahuel Huapi Nt. Pk.). VPR was established by Decree in 1926 with a followup Decree in 1950). Thank you for sharing. My how Santiago ahs changed. Wish I were there with you both to enjoy such a lovely spring adventure. 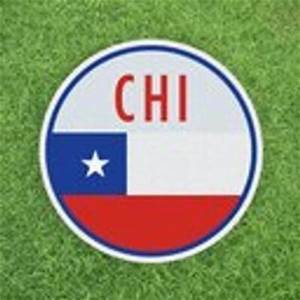 My Chilean family with whom I lived in the campo near Los Angeles also had an apartment on Pocuro just north of either Los Leones or Avenida Suecia, I don’t remember which. On an occasional weekend I would travel by bus or train from Los Angeles with their son, Guillermo, who was tragically killed in a car wreck along with his younger brother Pedro some years ago, to visit his family in Santiago, and would stay in the maid’s room as they had no maid. I remember how beautiful that area was, and am glad to see that it remains so today. Although they no longer have the apartment, I have fond memories of my Sunday lunches at the apartment with empanadas and the vino tinto. Thanks for sharing that wonderful walk and those great pictures. I have to agree that cancelling the TPP on the first day is not good for US agriculture since our ag exports play a key role in trade. And China is a big buyer of our grains. Instead of walking, I swim 1000M every other day which maintains my healthy appetite. Wishing you a Happy Thanksgiving. Sorry you all are feeling sad about the election but I for one am optimistic and very happy with the results. I have no doubt the U.S. will do just fine without the Globalists of the World giving us Marching orders. Having said all that I am sure our Constitution will work just great when once again it is adhered to.